I love nights that I’m able to wow my family with a home run dinner. They’re so patient with my recipe flops (because honestly, there are quite a few), and I love when I find one that they love. 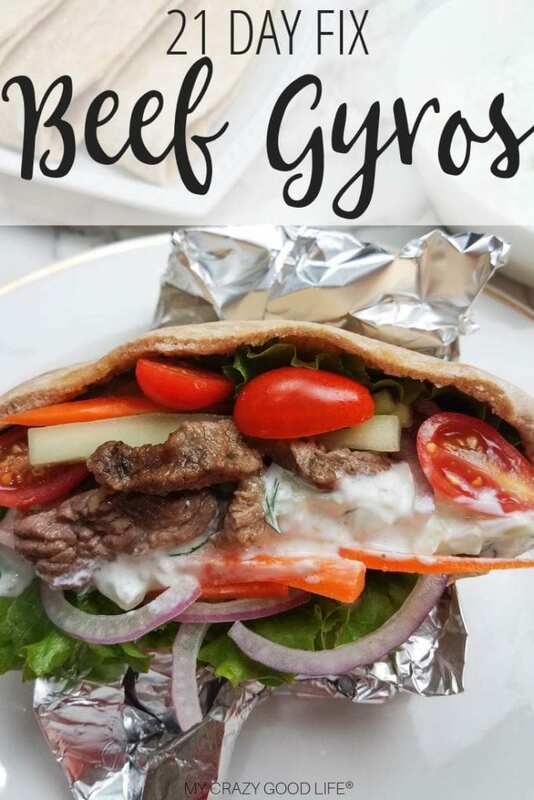 Which is why we LOVE these 21 Day Fix Beef Gyros. They’re easy to eat in a pita, on a salad, or in a bowl. You can swap out the toppings if you like, but I’m very partial to the cucumbers and carrots–trust me on this. 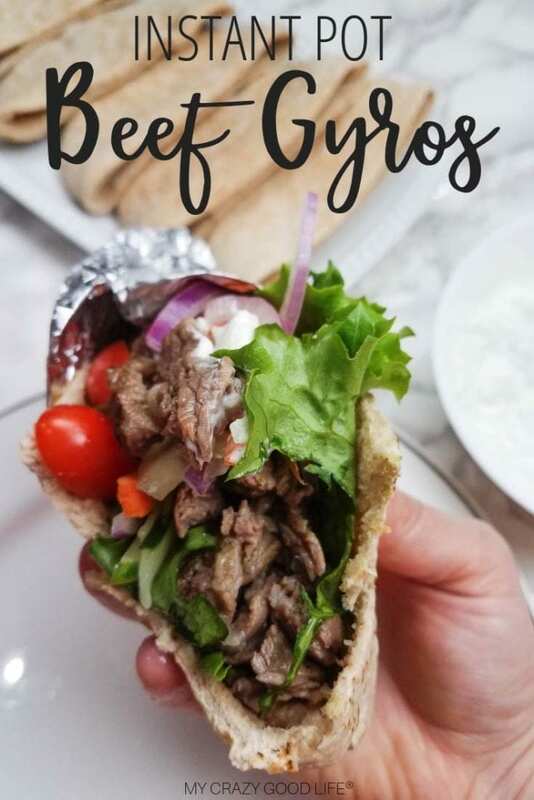 This is an easy beef gyro recipe that you’re going to want to save. SO easy with the Instant Pot, and so delicious. You can definitely use this recipe as inspiration to make ground beef gyros at home! Use the same seasonings and just sauté the meat instead of searing the meat. Everything else would be the same! Can I make chicken gyros with this recipe? Super easy to do! These seasonings taste delicious with chicken or beef–I recommend cooking everything just as the directions below instruct you to, but slice your chicken into thin strips before cooking it. What beef should I use for gyros? I prefer to get loin flap meat or a beef roast. As long as you thinly slice it and it has a minimal amount of fat on it, I think you’re safe. If ever in doubt, ask the people at your butcher counter–they’ve always been so helpful to me and they mention a lot that they are not often asked for help. What should I serve with beef gyros? I’m a pretty big fan of veggies and veggies on veggies–but you might also enjoy some quinoa on the side. Homemade french fries, baked potatoes, or a side salad would be delicious, as well. Can I make these Beef Gyros in the Crock Pot? You can for sure, but I have to tell you that they’re not my favorite thing to make in the slow cooker. When using the slow cooker, I prefer to make recipes that I can come home and eat with little work. I feel like all of the toppings that are needed for this recipe make it not the best “come home and relax” recipe after a busy day. I prefer to make these in the Instant Pot so that while it’s cooking I can chop my veggies and make my tzatziki sauce. Even better, I try and make the sauce earlier or the night before because it’s so good after it site for 30 minutes or so. For the Crock Pot, I’d add the spices directly to the meat and mix well. Cover and cook on low for 8 hours or on high for 4, making sure to check and see when your beef is tender. 1) Turn Instant Pot on sauté and let the pot warm up. When it’s warm, add oil to the bottom of the pot and let it get hot. Do this on your stove top, heat to medium heat. 2) Add meat, seasoning, garlic, and onion to Instant Pot. Sear and let onions soften for 3-5 minutes. Same cooking time for stove top. 4) Turn the steam valve to sealing. Using the Meat/Stew preset (you can also use the manual/high pressure button) and cook the gyro meat for 9 minutes. Let the pressure naturally release for 3 minutes before releasing the remaining pressure using the quick release method. Add lemon juice and broth, cover, let simmer for 10-15 minutes. See this chart for high altitude cooking variations if you are having trouble getting things to match up to times you see in recipes! 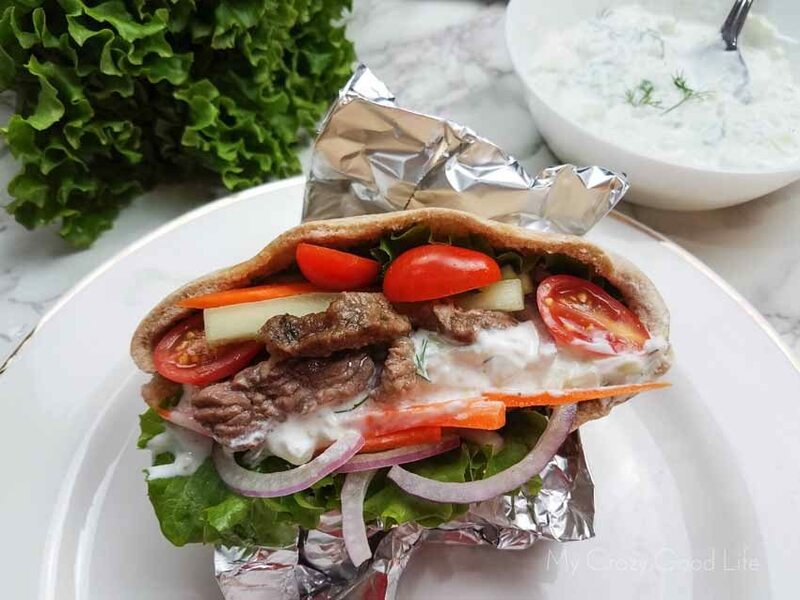 4) While the gyro meat is cooking, mix together the Tzatziki sauce and slice your vegetable toppings. For added flavor, drizzle apple cider vinegar and olive oil over vegetables. 5) To make your gyro, layer the lettuce at the bottom of the pita or naan bread. Then add meat, toppings, and sauce. This will keep the pita or naan from getting soggy too fast. 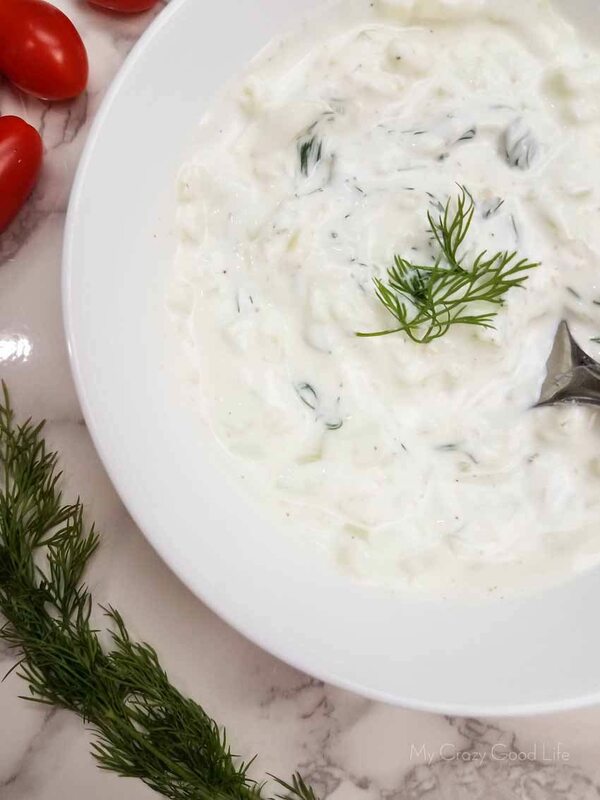 How can I make this Homemade Tzatziki sauce? Add Greek yogurt, minced cucumber, minced garlic, salt and pepper and dill to a small bowl and stir together. Refrigerate until ready to use. 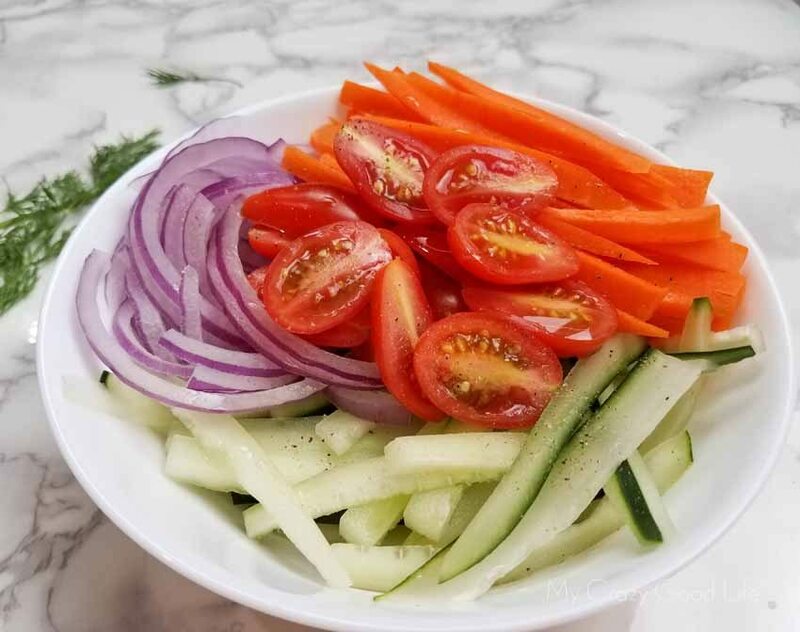 21 Day Fix container count: 1C filling and vegetables + 1/2 pita = 1 yellow container , 1 red container, 1 green container | sauce: 1/4C = 1/3 red container, I don’t count the green from the cucumbers since the amount of negligible. 1 Serving (serves 6) equals 6 Freestyle SmartPoints when you use beef roast, one Joseph’s Whole Wheat Pita bread, and nonfat Greek yogurt for the sauce. Recalculate your containers if you use a different bread. 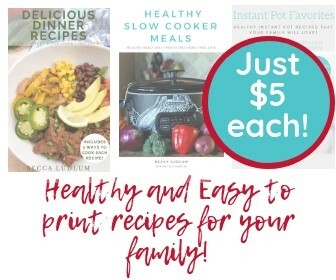 If you’re looking for more Instant Pot recipes, I have created a printable eBook for you! 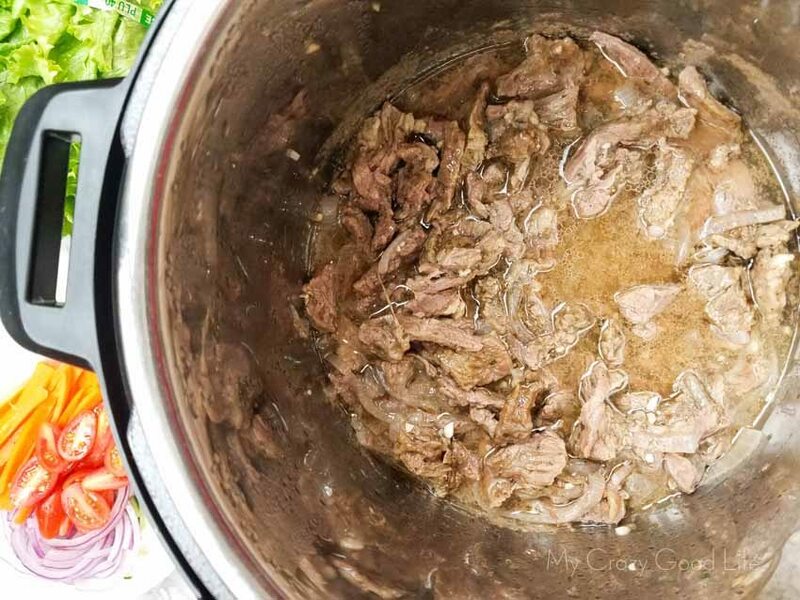 Turn Instant Pot on saute and let the pot warn up. When it's warm, add oil to the bottom of the pot and let it get hot. Add meat, seasoning, garlic, and onion to Instant Pot. Sear and let onions soften for 3-5 minutes. Pour lemon juice and broth over the meat. Give the meat a quick stir, then lock lid into place. Turn the steam valve to sealing. Using the Meat/Stew preset, cook the gyro meat for 9 minutes. Let the pressure naturally release for 3 minutes before releasing the remaining pressure using the quick release method. While the gyro meat is cooking mix together the Tzatziki sauce and slice your vegetable toppings. For added flavor, drizzle apple cider vinegar and olive oil over vegetables. To make your gyro, layer the lettuce at the bottom of the pita or naan bread. Then add your meat, toppings, and sauce. This will keep the pita or naan from getting soggy. Stove top and Crock Pot instructions are in the post above. Hi Michelle! I think it’s more about ease of counting. If you can separate the meat and the veggies, definitely do that! Not officially a 21 Day fixer (yet) but wanting healthy recipes. Just finished this and I’m sold. So tasty, tender, and quick. I will be coming back for more recipes! Thanks. Do the 9 minutes on meat/stew start right away or does the pot take a few minutes to heat all the way up and then start the 9 minutes of cooking? Set your IP for 9 minutes. It’ll take a few minutes to pressurize. I use several types, it kind of depends what looks best at the butcher! Sometimes chuck, sometimes flank steak, and when I can find it at Costco, I use loin flap meat. Hi Becca! Can I make these in the crockpot? If so, what would be cooking time? Thanks!